1. Benz 3344 type II chassis is adopted into DG34C, which has advanced performances, strong bearing capacity and full power reserves (320kw/31.45t) and its emission level reaches EURO 3. 2. The firefighting system has all-round functions and the pump and fire monitor have outstanding performance. 3. It’s designed to have an in-built fire-fighting tank with a capacity of 4.7 tons of water, and a manual type PS30/50D fire monitor is equipped on the upper part of the tank for fire fighting operation. 5. Innovated structure promotes working performance and safety. 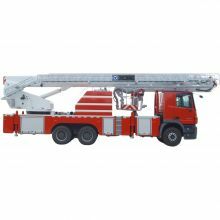 The telescopic boom is octagon fitted with great circle arc section, with hydraulic cable transmission chain in-laid, which gives it a compact structure, good appearance and a strong bearing capacity. 6. Lifting holes are added, so that lifting function can be realized by elevation of amplitude cylinder. The basic boom head can lift a weight of 2t and the lower part of platform can lift 0.4t weight. 7. LS load-sensing control system of double variable displacement piston pump is adopted in hydraulic system, proportional valve opening characteristic curve is optimized, working pressure for leveling function is promoted and operation performance is improved. 8. Working parameters of the overall vehicle are ahead of domestic market. 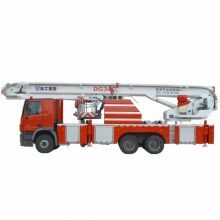 The maximum height is -3～34.5m, the maximum working range is 21m, rational layout and well-distributed axles and loads give full play to vehicle stability and boom bearing capacity. 9. Enriched optional parts. 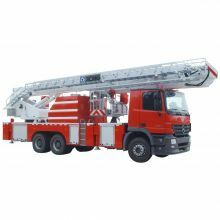 The material of tanker body is customized according to customer’s demand; all of the following systems are offered as options, such as reverse monitoring system, electric centralized lubricating system, on-board generating unit and high power lighting system, fire scene monitoring system and anemometer.